Today, we’re incredibly proud to introduce the world to Carusele, a new standalone content marketing company launched by Ignite Social Media. As we announce the formation of the company today in Austin, TX during the SXSW Interactive event, I want to explain clearly what Carusele is, what it does and why it’s different. Content marketing is not new. And there is no lack of content marketing websites and approaches. Many traditional publishers are setting up branded content divisions, and influencer networks have been launched for years. 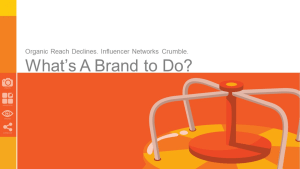 In many cases, those same influencer networks and content hubs have already closed. When John Andrews joined Ignite Social Media as our CMO in January, 2014, he and I had a theory. That we could take our different approaches to branded social media marketing and combine them. Our hope was that in doing so, we’d come up with a new approach that leveraged both content producers (as John did when he created Walmart’s Elevenmoms) and the unique skillset that one of the nation’s leading social media agencies can provide. John came up with the name Carusele, because he had a loose vision of content being liberated from any one website, and a community manager standing on the side of the carousel, making it spin faster and faster through the social web. A neat idea, and one that he, I and many others have been honing in the 15 months since. Today, we announce Carusele as a standalone company, having already sold over $1 million of Carusele test programs since summer 2014. We used these initial programs as test and learns, adding new approaches each time, but always exceeding our promised goals. So what is Carusele? We start with our network of over 5,000 content producers, and we hand-select the right group for each brand program. Through those content producers, Carusele creates high-quality, sharable content and then actively manages it through an Organish™ media approach that combines organic and paid syndication and aggregation, resulting in scaled, targeted audience reach. As a result, we are delivering greater reach, engagement and conversion than paid advertising alone. We’re also improving online share of voice for brands in the short-term. But even after the campaign ends, the hundreds to thousands of pieces of content live on, all across the social web, on every relevant social channel. We call this Content Everywhere™ and the result is years of branded content being discovered by the right people for our clients. In doing so, we’ve created a simple way for marketers to buy engaging social media content with defined audience reach much like they do with broadcast, print and digital media. And our community managers can then evaluate the performance of each piece of content in real time, helping further boost the highest performing content for even greater reach. The brand also gets the ability to use all of the best performing content on their own social channels at no additional cost. In short, we’re now able to create a packaged social media buy that delivers true engagement vs. just pushing messaging at consumers. In just our pilot programs, we have delivered over 500MM branded impressions, high levels of engagement, hundreds of thousands of coupon downloads and in some cases measurable lifts in sales, at a price that is highly competitive to that of other digital media. We’ve also found a content marketing mix that benefits both brands and the influencers equally, which makes for a strong value equation. The founders of the company including myself, my Ignite Social Media partners Marcie Brogan and Deidre Bounds, and John Andrews. We decided to make Carusele its own company while incubating it within Ignite Social Media for a variety of reasons. Perhaps most importantly, Carusele is purchased by brands as a media buy, with guaranteed impressions levels, while Ignite Social Media sells services in an agency model. In addition, we wanted to give Carusele all the support it needed to thrive, with all the freedom it could need to grow. If you’re a content producer who would be interested in working with us, please let us know. We’re always looking for more talent. If you’re a brand, looking for a way to produce branded social media content at scale, please let us know. We’re excited about sharing our initial results with you, and creating new ones that drive your business. Big thanks to all my Ignite Social Media team members, so many of whom have contributed to the development of this new company.